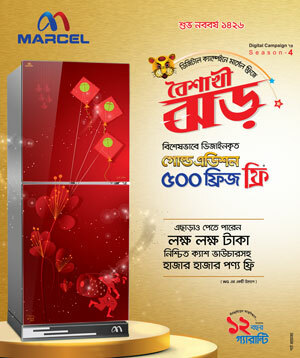 Economic Reporter: A 3-storey premiere pavilion has been erected by the country’s electronics giant ‘Walton’ at the premises of the upcoming Dhaka International Trade Fair (DITF) – 2019, scheduled to begin on January 9 at the capital’s Sher-e-Bangla Nagar, to showcase and sell out its wide ranges of electronics and electrical appliances. Walton followed ‘Green Technology’ method during the erection of its premier pavilion (number-23). The pavilion will be featured with mural, 98-inch LED Television, 18 feet widths entrance or exit gate, 7 feet widths stairs for easy moving in different floors, lift, enormous fire and electrical safety equipment. The entrance gate is decorating with terracotta. At the ground floor of the pavilion, Walton brand’s world-class frost and non-frost refrigerators, freezers, televisions, washing machines, electric and microwave ovens, blenders, induction cookers, gas stoves, electric fans, switch-sockets, acid led rechargeable batteries, LED lights and other sorts of electrical and home appliances will be showcased. 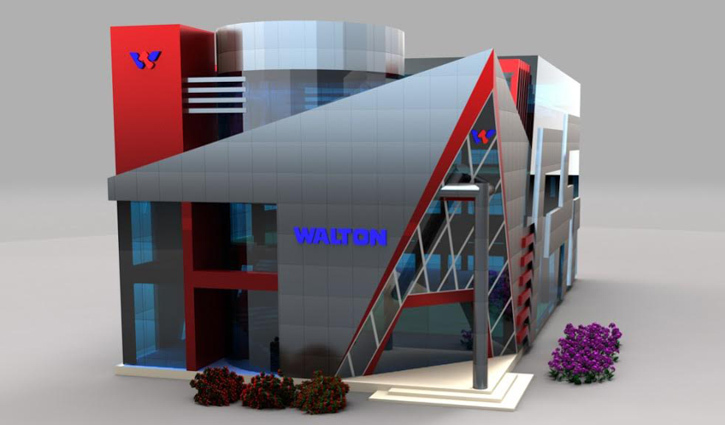 Walton brand smart and featured phones, laptops and accessories, lift, air conditioners, compressors and Industrial Solutions will be showcased at the first floor. And, the second floor will be used as store room. Walton Group’s Executive Director Md. Humayun Kabir said, this year a colorful mural of the Bangladesh’s electronics manufacturing sector pioneer named SM Nazrul Islam will be in the pavilion to pay tribute to his outstanding contribution. A 98-inch LED televisions will be set up in the pavilion as the upcoming model, in which corporate documentary as well as production processes of different sorts of electronics and electrical appliances at Walton factory will be displayed, he added. Pointing at the safety issue, Walton Pavilion’s Architect Sadde Mohammad Rumman said, they are establishing premier pavilion on total of 7,500 square feet with the aim of luring buyers and visitors. Emphasizing the safety issues, Walton used high quality steel made beam, frame, Aluminum Composite Panel (ACP) board, glass as well as other fire and safety equipments, he said adding, adequate fire extinguisher will also be at the pavilion. “We followed the green-technology method during the establishment of Walton Mega Pavilion at the DITF-19. And, about 90 percent construction materials of the pavilion are reusable, he noted. Dwelling on the preparation, Walton Pavilion’s Convener Selim Reza said, the construction work is completed. Now, they are decorating the interior part of the pavilion. Today, Walton is the premier electronics brand in the local market, claiming it he said, thus most of the visiting buyers-customers at the DITF throng Walton Pavilion. Considering such huge customers flows, an 18 feet widths entrance and exit gate will be available at the pavilion so that large number of buyers or visitors at a time can pass through the gate, he said. Walton Group’s Executive Director (PR and Media) Md Humayun Kabir said, Walton employed more than 50 exhibitors. They are divided into several groups based on different products and given higher trainings on product’s uniqueness, corporate behaviour and culture and on how to provide better customer service. Mentionable, Walton secured the highest VAT payer title since the inception of the recognition of the highest VAT Paying enterprises at the DITF. In addition, the local brand honoured with Best Premier Pavilion Award several times at the DITF.